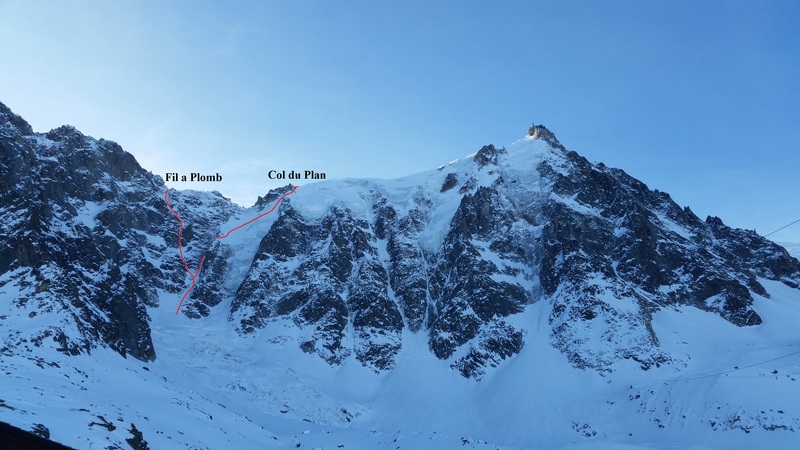 What`s the best way to acclimatise around Mont Blanc massif? 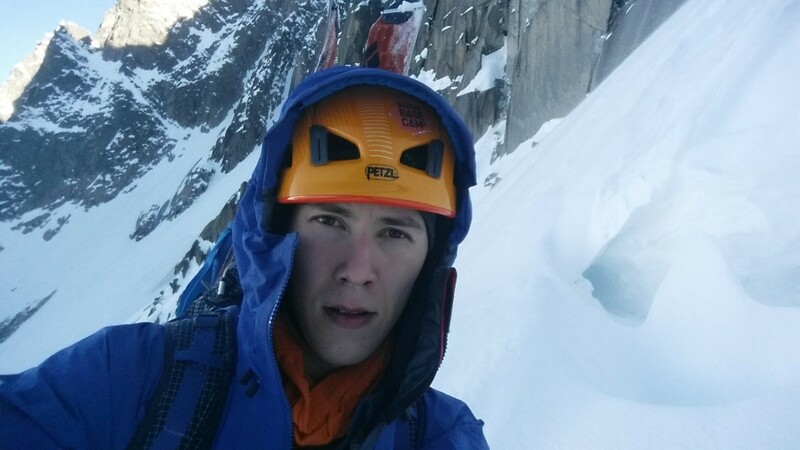 One of my favourites is to climb Aiguille du Midi`s north face. Short approach combined with a cable-car descent couldn´t be easier. Both of the lines seen from the Plan d´Aiguille. At the begining of March I´d just arrived to the village the previous night and deciced to climb Fil a Plomb as a warm up. Eventually I choose Col du Plans N face, because one other team was just behind me, and I knew their plan was to do the Fil a Plomb. When soloing, at least I, want to enjoy solitude, peace and movement. I was carrying approach skis, two half ropes and a light bivi kit, due to my plan to solo something on Tacul`s East face the following day. Too much gear I can say now. Recent storm had bring lot of fresh snow and it clearly slowed my progres. First couloir steepens after couple hundred meters and the line exits via a mixed ramp on the right hand side. Final romp up to the col was miserable wading in a deep snow. 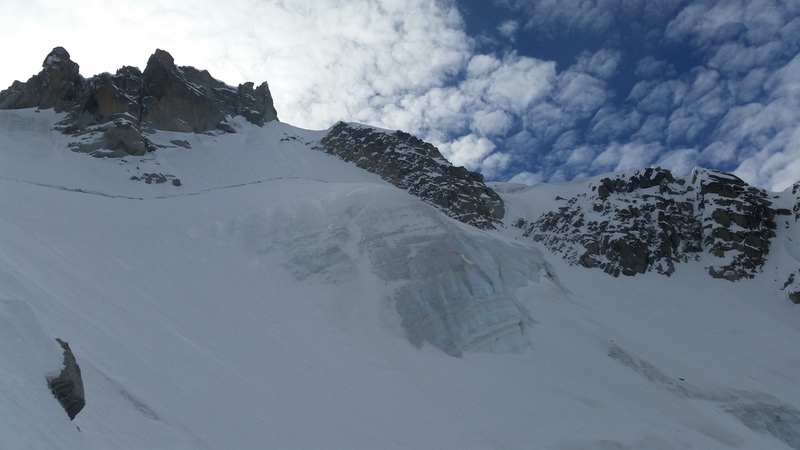 The day got even worse when Midi`s staff forced all climbers back to valley. Free ride down, but I`d carried all the gear up for nothing. A few days later I went for the Fil a Plomb, carrying skis again. 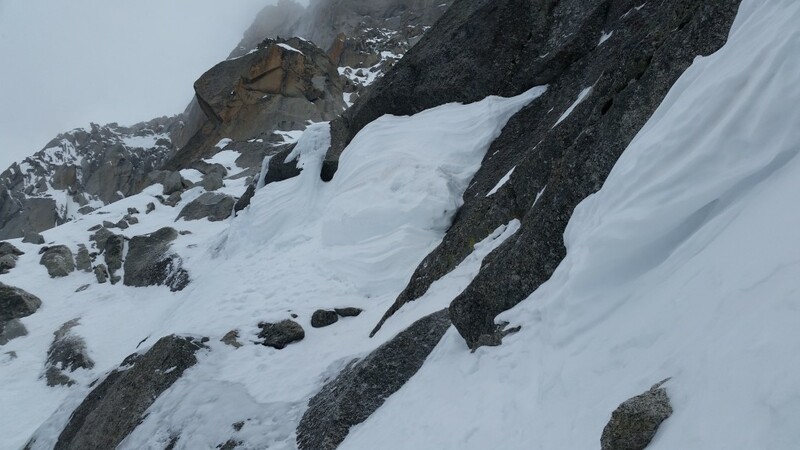 Foehn wind was excpected to start around noon, but luckily the route is in a corner and it´s climbable in a bad weather. Lower slopes are easy and I quickly reached the crux: 40 meters of steep ice. Start of it looked really technical and some locking moves were required to get on to the ice. Hollow, airy and exciting pitch to free solo. Once on the top, I rappelled down to pick up my pack and top-rope soloed the pitch up. Rest of route was easy, except annoying mushroom traverse. At the col wind howled like a crazy. There were no chance to climb up to Midi, so remaining option was to ski down to the Montevers. Whiteout conditions forced to spend one night at the Requin hut though. Not very often you can enjoy the peace on a popular classics. Fil a Plomb`s mushroom traverse. One of the only pictures I took with a phone.